Home » F.A.Q.’s WordPress Training | WordPress Course in Lakeland, Tampa, and Orlando! F.A.Q.’s WordPress Training | WordPress Course in Lakeland, Tampa, and Orlando! 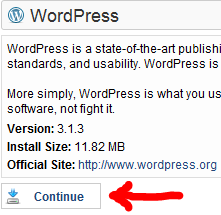 There is useful information about this distinction on the WordPress.com website. Can I transfer my blog from WordPress.com to self-hosted WordPress installation? WordPress.com is a blog network run by Automatic. It uses WordPress software, but individual blogs are hosted and managed by WordPress.com. This is a free service with premium add-ons and upgrades. Here at WordPress.org, you can download WordPress, the web software that WordPress.com runs on. Once you’ve downloaded it, you can upload it to a web server and run your own WordPress website. It can also be installed automatically on most major ISPs like 1and1.com and GoDaddy. Can I transfer my blog or website from other services to a self-hosted WordPress installation? You can transfer any blog or website from any service you wish. We have a list of guides which will help you to transfer from your specific platform. Learn more about WordPress terms: where can I get help? Bring Your Laptop that is ready to connect via Wi-Fi. WordPress in an online platform that requires access to the internet. If you do not have your domain and hosting you can sign up for hosting and domain at 1and1 (preferred). Choose Linux Hosting,“Unlimited” or “Performance” Package, which includes a Free domain name. Bring a light sweater or jacket. The room gets cold at times. Lunch will be on your own from approximately 12:30 p.m. to 1:30 p.m. There are several convenient restaurants in the area, including Boston Market across the street. Coffee and donuts will be served. Parking is Free. Please arrive as early as possible. We will be here beginning at 8:30 a.m. to help you get setup. We begin sharply at 9:00 a.m.
Email Carmen Lopez if you should have any further questions at: carmen@nmx2.com We look forward to seeing you at the course. These are the instructions for setting up WordPress Website on your Internet Service Provider, ISP, 1and1.com, GoDaddy and Host Gator. 1. Log in to your Account Manager. Click one of the following, based on the type of hosting you have. You can tell this by the second word in your hosting’s description beneath your hosting account’s domain name, e.g. Deluxe Web correlates to Web (Hosting Control Panel). 1. Next to the hosting account you want to use, click Launch. 2. In the Popular Apps section, click WordPress. · Domain — Select the domain on your account you want to use. · Directory — Enter the directory after the domain name where you want to install WordPress. If you want the domain name itself to use WordPress, the directory field should only have “/” entered. · Enter a Username, a Password (and its confirmation), and an Email Address. WordPress will be installed to your hosting account with the options you selected within 24 hours. When it is complete, you will receive a confirmation email. 2. Scroll down to the Software/Services section and click on the QuickInstallicon/link. 5. Fill out the Application URL, if needed. Note: This is the path where you want to install WordPress. If you leave this field blank, WordPress will be installed to your main domain. 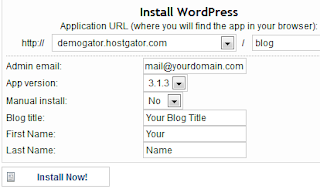 If you use blog in this field, WordPress will be installed to http://yourdomain.com/blog. Don’t leave this blank if you don’t want WordPress to be your main website or if you already have content on the root of your account. 8. After WordPress is finished installing, you should see a “Congratulations!” message like the one below with a link to click here. Click that link, and it will bring you to your newly installed WordPress blog! Your admin password will be emailed to you at the email address you provided in step 7. Retrieve your password and then visit the URL to which you installed WordPress, adding /wp-admin — Visit our login tutorial for more information on how to log into WordPress. Note: If you recently changed your name servers or DNS records, it is possible that you will not be able to access your new WordPress installation until the domain propagates. This could take up to 24 to 48 hours. You will see “Installing”. When WordPress installation is ready (15 min to 2 hours) 1and1 will send you an email, or you can refresh the page to see if the installation is ready. Remember to select Linux Hosting and SQL Database Option for your hosting. NMx2 WordPress Training Course Synopsis In our Hands-on WordPress Website Training Course you will learn how to use one of the most popular and practical website building tools available. WordPress is a simple website building program, content manager as it is called, that allows you to build and manage your own website with a small amount of training and effort. You can have a high quality, functional website in no time at all. You will be able to edit and modify it yourself without depending on others, and without spending tons of time and money.